Everyone loves empanadas. They are warm, flaky, sweet, salty, and typically filled with greatness. But, like the dessert pasta, what if we take them in a different direction? 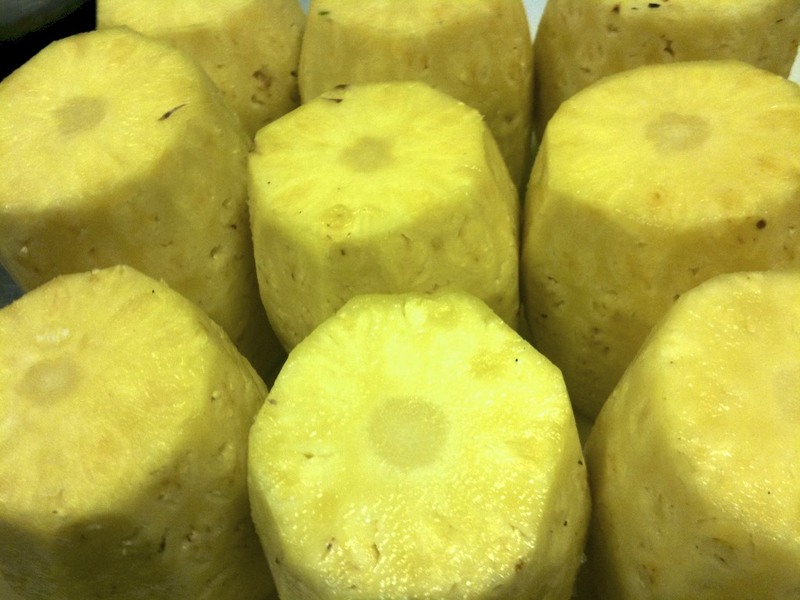 Instead of empanada dough – how about pineapple? Step one: buy really nice, ripe, juicy pineapples. A good trick to tell is if it has that beautiful yellow colored peel, but even better- flip it over and smell the core. If it smells like good pineapple- it will be. Peel the pineapple, but leave the core completely in tact. Try to make the pineapple as round and smooth as possible, as it will lend itself better to the final assembly. Next, using a meat slicer, a really great mandoline, or just your good old-fashioned knife skills, slice rings about one millimeter thick. 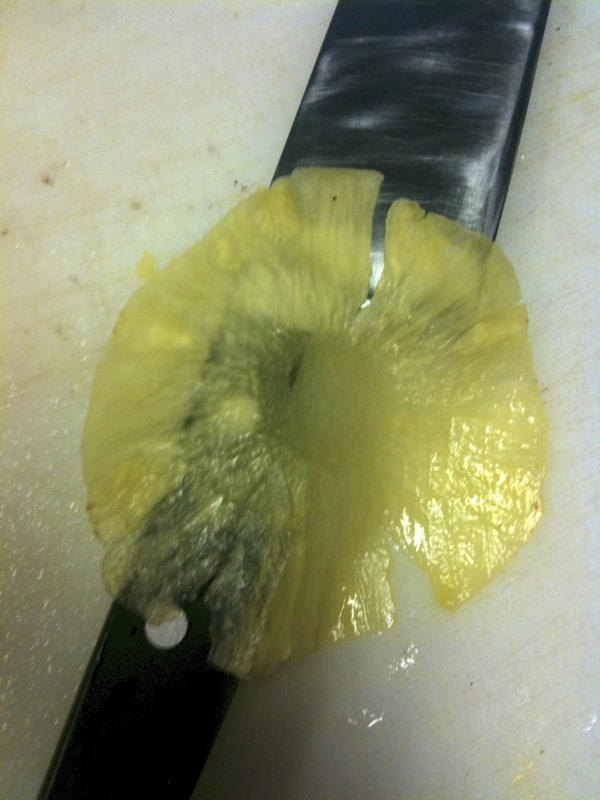 The pineapple should be translucent, barely pliable, and of uniform thickness. Poach the pineapple slices in simple syrup. You can add additional flavors if desired, but be sure to include all the runoff juice from the sliced pineapple. 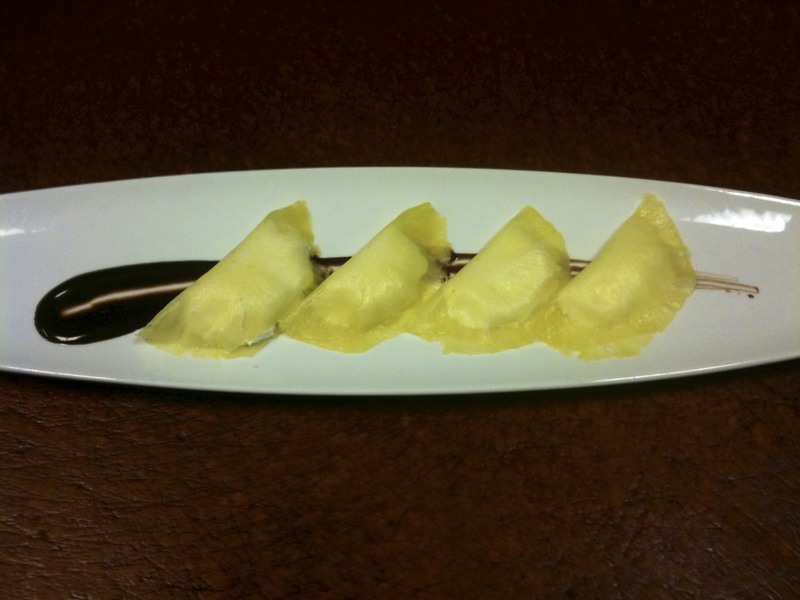 Poach for 20 to 30 minutes, until the pineapple slices are smooth and flexible. Keep in mind that they will continue to soften as you work with them. For the filling, you can add ganache, poached fruits (apples, kumquats, pears), or pudding (vanilla, cherry, coconut, orange curd, grapefruit curd). depending on your filling, it will probably be mostly the same texture. You may want to add some kind of crunch, like puffed rice or, my personal favorite, nopal cactus paddle. Remember that the pineapple is translucent, so colored fillings will show through. The final product should have a sweet, low-acidity, pineapple flavor. I like to eat and serve these warm, but they can also be served slightly cooled if preferred.